For those who are looking for computer gadgets sale, you might want to visit the “Computer Gadgets Holiday Blast” at SM North Edsa. 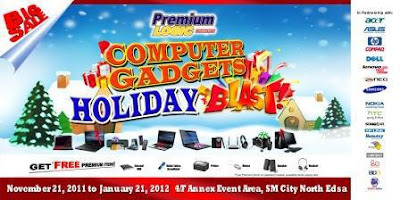 Premium Logic Computers offers great gadgets sale that already started from November 21 up to January 21, 2012 at 4F Annex Event Area. You can enjoy discounts from various brands such as Lenovo, Asus, Neo, etc. with the latest gadgets and gizmos. I am planning to buy a printer and I hope I can find great deals at the computer gadgets sale. This entry was posted in Technology and tagged Computer Gadgets Sale at SM North Edsa. Bookmark the permalink. Thanks for your personal marvelous posting! I actually enjoyed reading it, you will be a great author. I will make sure to bookmark your blog and definitely will come back later in life. I want to encourage you to definitely continue your great posts, have a nice day!